Higher education is struggling these days, and there are a lot of solutions from a lot of pundits, all of which tend to be macro in nature: Delivery, cost structures, optimization, curricular adaptations, and many other ideas abound. On the micro level., however, the vast majority of the 1,700 or so private, four-year colleges and universities will point to "increasing our endowment" as one of the most crucial solutions to our internal institutional challenges. Let's say your Advancement Office budget is $8 million per year. It would take an endowment increase of about $160 million to throw off that $8 million in cash each year forever (at 5%). Thus, shutting down the Advancement function completely would be the equivalent of raising $160 million in unrestricted endowment overnight. Unrestricted dollars are the hardest to raise, of course, because people don't tend to say, "Here's five million dollars; do with it whatever you want." Due to head starts and compounding, the wealthiest institutions are so far ahead of the rest of us that even trying to catch up seems futile. Of course, that stops no one from relying on the old "tried and true." In reality, our only hope of catching up with them would be a catastrophic market crash with no rebound; even then, we'd all be poor. No solace there. Take a look at the interactive visualization below. Each bubble is an institution. Hover over a bubble for details. 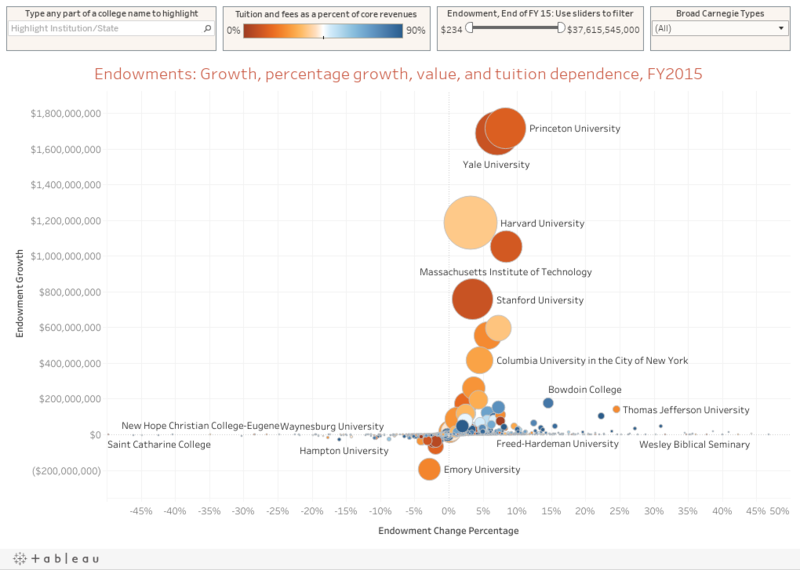 The COLOR of the bubble indicates tuition dependency (in IPEDS, "Percent of core revenues from tuition and fees.) Orange is low; blue is high. The relative position on the y-axis (up and down) indicates one-year endowment value change (note: This is just subtraction, so it is not endowment performance). The relative position on the x-axis (left and right) shows the one-year percentage change. I cut it at 50% each way for clarity as there were a few extreme outliers. If you'd like, you can use the filters at the top right to limit the types of institutions shown, or the range of endowment values. Use the highlighter at the top left to highlight a specific institution. Just start typing any part of the name to do so.